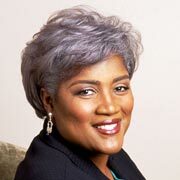 Veteran Democratic political strategist Donna Brazile is an adjunct professor, author, syndicated columnist, television political commentator, Vice Chair of Voter Registration and Participation at the Democratic National Committee, and former chair of the DNCs Voting Rights Institute. Last, but never least, she is a native of New Orleans. Aside from working for the full recovery of her beloved New Orleans, Ms. Braziles passion is encouraging young people to vote, to work within the system to strengthen it, and to run for public office. A New Orleans native, Ms. Brazile began her political career at the age of nine when she worked to elect a City Council candidate who had promised to build a playground in her neighborhood; the candidate won, the swing sets was installed, and a lifelong passion for political progress was ignited. Four decades and innumerable state and local campaigns later, Ms. Brazile has worked on every presidential campaign from 1976 through 2000, when she served as campaign manager for former Vice President Al Gore, becoming the first African-American woman to manage a presidential campaign. Author of the best-selling memoir Cooking with Grease: Stirring the Pots in American Politics, Ms. Brazile is an adjunct professor at Georgetown University, a syndicated newspaper columnist for United Media, a columnist for Ms. Magazine, and an on-air contributor to CNN, NPR, and ABC, where she regularly appears on This Week with George Stephanopoulos. In August 2009, O, The Oprah Magazine chose Ms. Brazile as one of its 20 remarkable visionaries for the magazines first-ever O Power List. In addition, she was named among the 100 Most Powerful Women by Washingtonian magazine, Top 50 Women in America by Essence magazine, and received the Congressional Black Caucus Foundations highest award for political achievement. A former member of the board of directors of the Louisiana Recovery Authority, responsible for leading the states rebuilding process in the aftermath of two catastrophic hurricanes, Ms. Brazile is the proud recipient of honorary doctorate degrees from Louisiana State University and Xavier University of Louisiana, the only historically Black, Catholic institution of higher education in the United States.